I LOVE this rug! i get so many compliments on it. 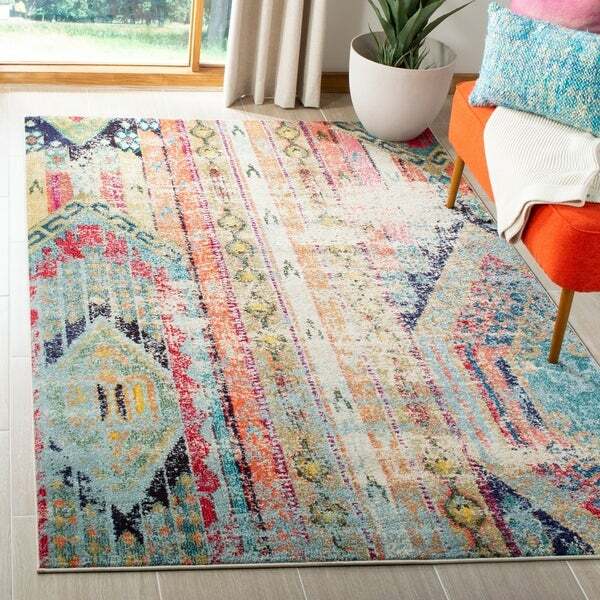 Safavieh Monaco Vintage Boho Multicolored Distressed Rug - 5'1" x 7'7"
Safavieh Monaco Vintage Boho Multicolored Distressed Rug - 4' x 5'7"
Free-spirited and boldly colored, this rug from Safavieh's Monaco Collection brings Bohemian-chic flair to contemporary and transitional home decor. This rug's design is inspired by southwestern geometrics with an abstract twist. Featuring neutral hues of cream, beige, and black, and more vibrant hues of pink, orange, and blue, this rug is truly a work of art. The pattern and color is just enough to compliment my room without overshadowing. It is also plush enough that I am not using a carpet pad. Love love LOVE this rug on my concrete floors! It's exactly how it's pictured (as in, the colors and different shapes, not necessarily the EXACT pattern). It's softer than I expected, and with all the colors it has in it, you can literally go any direction with it. I decided to bring out the peach and teal colors and I'm loving it. Keep in mind, I've only had it a week, but it seems well-made (at least for the price. I got it on sale for ***). I say that because my dog lays and plays on it frequently -- he loves it just as much as I do -- and it's still all in one piece. The one thing I noticed that I probably wouldn't have if I didn't read a bunch of other reviews, is that there IS one spot in the carpet that seems to be much more "distressed" than any other part. 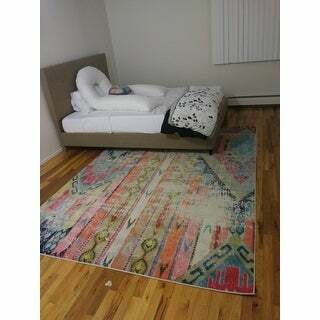 However, I think that's the beauty/struggle of getting a distressed rug. Plus, it looks like it's advertised in the photo as well. 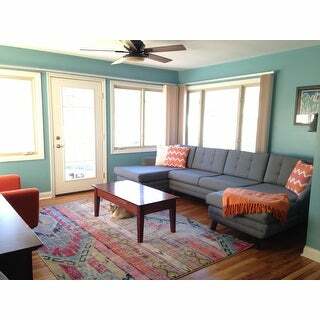 Definitely recommend this rug for someone looking for a pop of color without going overboard. I am in love with this rug! The colors are gorgeous and it is very soft. I am trying to make my dining room more eclectic, and this rug is perfect! Absolutely gorgeous rug. 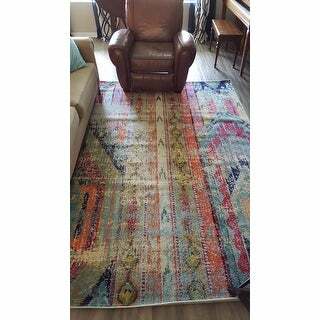 I've been eyeing this Safavieh Monaco Vintage Bohemian Multicolored Distressed Rug for quite a long time and when it went on sale-i snatched it up! This rug is very colorful and yet the distressed quality tones that down. I didn't want a rug that screamed, but did want color, and that's what I got. The photos on the website are accurate. This rug is just thick enough to be soft underfoot, and just stiff enough to hold it's shape. Mine is 6'x9'. I will likely put a pad underneath it so I can use it as my yoga rug - and be quite comfortable. I'm very pleased with my rug! This rug is perfect for our space. It brings color and pattern into an otherwise really gray palette. We just laid the rug out - so time will tell how it performs. Generally speaking, polypropylene wears like polyester (not great) and it can soil faster with body oils and food - however this type of fiber is usually a solution dyed fiber, meaning the color is through and through and done before the extruding process. This should make it easier to clean spills and dirt. I wanted to use the pattern to my advantage to help hide spots/dirt, if I cannot get them out. This beautiful rug is even more so in person. 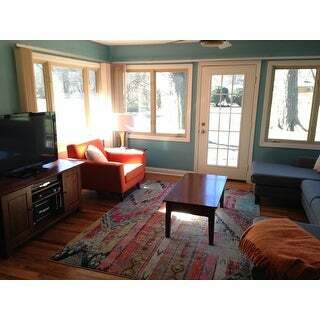 The photos capture the colors accurately, but will vary in brightness depending on the lighting in the room. 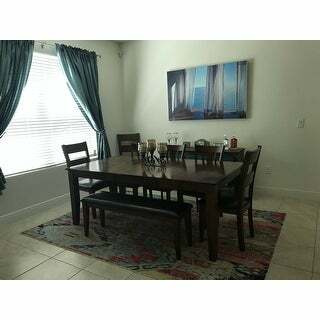 We use this rug under our dining table with a rug pad as the surface of our dining space is tile. You will want to use a rug pad with this item on hard surfaces, but it will also display well on top of carpet when you secure it with carpet tape. I have been looking for a rug that isn't traditional and I came across this one. I read the reviews and most people were not pleased with the large amount of pink in the rug so I was skeptical to purchase because that was one of the colors I was trying to avoid having too much of. I must say that the reviews were completely incorrect. The rug is distressed and the pink is not dominant at all. It flows nicely with the other colors. The material is thicker than I thought as well. I couldn't be more pleased with my purchase! I would say that the rug looks identical to the pictures and I would most definitely recommend it if you are wanting a non traditional look like I was. You will be pleasantly surprised! 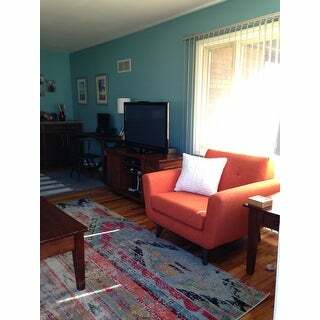 Love this rug, colors are vibrant and the rug is so soft!! This rug is really pretty, the colors give many options for decor. It's also very soft underfoot, and cleans up easily...as we found out after less than a week when one of our kids spilled on it. We put it on luxery vinyl plank flooring and havent felt like we need to add a rug pad. 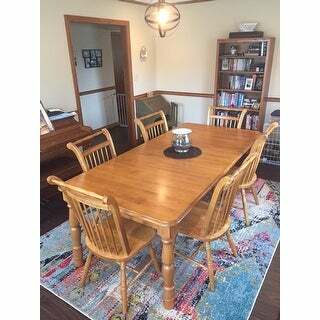 We're so happy with it, and feel it's great quality at a great price point. Even more vibrant than it appears online. Great addition to my open living area! Love this rug! 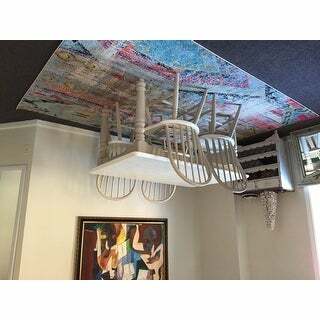 It is in our dining room! This rug is everything I expected and more. It looks so much prettier in person. The colors are not so bright nor they are so fade. I got inspired by the bedroom photo associated with this item and I tried to replicate it in my new apartment. It looks super awesome. I am extremely happy with this rug. **The only draw back is that what appears to be black, is actually dark navy - indigo. Still pretty but just putting that out there, because I perceived it to be black judging by the posted photos. It’s been a long tome since I have treated myself to a new area rug. This item came exactly as pictured, even better. Very well quality made. Both masculine and feminine appeal. Distressed effects will be forgiving as rug ages with traffic of family and our dog. If you purchase this you will he very pleased to receive it exactly as pictured & described. This is for my home office, but in the meantime my 7 yr old son insisted I temporarily put it in the sitting room. It may stay there and I am considering buying another to compliment. Economical and well made. 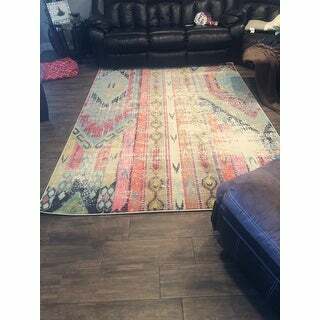 This is a great rug beautiful colors and pattern. I have it in my dining room and have received many compliments on it. It’s great quality and I would definitely order again or recommend to a friend. Purchased to put under dining room table over another carpet. Bunched up terribly even with a pad and became misshapen. Nice rug though thin. Bought 4 of these matching rugs in different sizes. They look even better in person and I've received many compliments on them. I really love this rug. There are so many bright and beautiful colors without it being too loud and attention grabbing. Definitely recommend. With fast free shipping, this rug will add any "pop" of color to any room of your house. 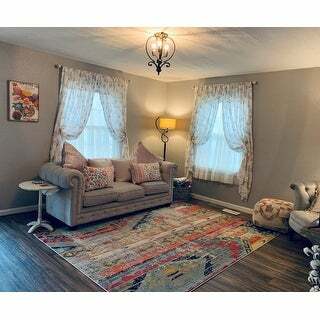 I was impressed by the vibrant colors the rug provided to the room, the pictures on the website give this rug no justice it is prettier in person. It laid flat within a day of me putting it down. I hope that anyone who buys it enjoys this rug as much as I do. I absolutely love this rug. I put it in my living room and everytime people come over, someone is always commenting on it. My iRobot vacuums over it daily, because I have two dogs that shed, and it cruises up and over it just fine, not snagging or lifting up the corners. 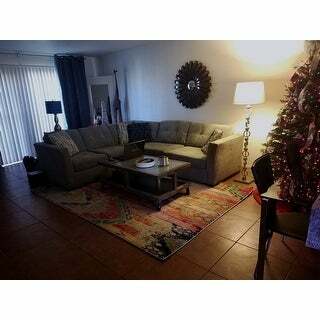 Good quality rug, modern and stylish. This is an amazing rug, so soft and beautiful and it feels very expensive. I get many compliments! "Is there turquoise or teal in this rug?" The blue found in this rug can be described a teal. Please note that colors may vary due to dye lot variance in production. yes. there is a little bit of every color in this rug. it will go with anything. 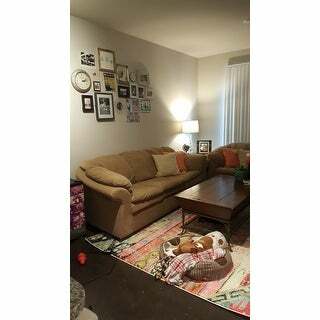 "For people who've purchased this rug, does it look feminine or does it look gender neutral in person?" "Can you use this rug outdoors? It keeps coming up when I search outdoor rugs"
most likely , since it's made of synthetic materials . I do not think so. I will not resist too much sun or water. olive green with a yellowish hue ...didn't care much for it in daylight ! "Along the edges of the rug is it blue or cream? I'm seeing cream rim in there first few pics and blue rim in the last few." Mine is a cream rim. Love the rug - so many colors to play with! I would say there is some olive green in the rug. However, it matches whatever you want to use. It is multicolored for sure. Any color gets picked up. Very nice rug and great muted colors. "Is this rug very pink? I'd like to put it in my son's nursery but am hesitant as I can't tell from the images if its overly feminine." Not pink , very multicolor. I have it on an outdoor porch as the focal point with neutral furniture and am very pleased. The colors are very muted. I have the rug in my dining area. The walls are a beige tone and it works very well with this color. It is n ot overly feminine. The tones are very soothing. not at all ..if anything the blue shades are prevalent ! 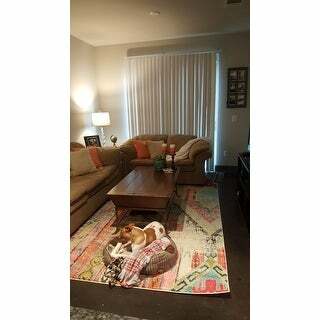 "Can I use this rug in a screened covered lanai? Yes"